Summer in Australia calls for fresh, light meals that are quick to prepare and showcase the best of the seasons’ produce. 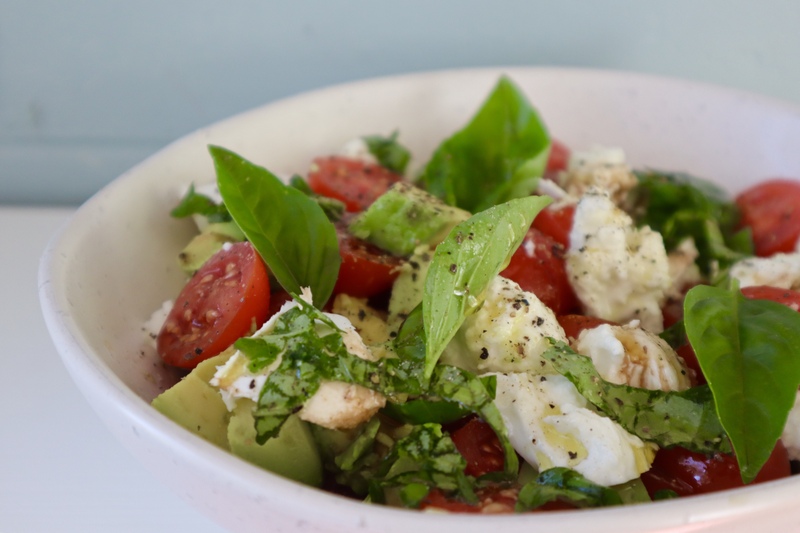 This is such a simple salad that is perfect this time of the year when juicy, ripe tomatoes are in season and basil is growing abundantly in the garden. It is lovely as a meal in itself served with some crusty bread to mop up the delicious olive oil dressing. It is also perfect as a side to lemony, garlicky roast chicken or a piece of grilled fish. To make, simply layer halved cherry tomatoes and chopped avocado in a bowl. Drizzle with balsamic vinegar and olive oil. Tear buffalo mozzarella in to pieces and layer on top. Top with fresh basil leaves and season with salt and pepper. Serve and enjoy! Yummy. A combination of all my favourite food! Nutritious AND looks delicious! I will have to try it. Normally, a caprese salad is my favorite summer salad, usually with tomatoes and basil fresh from the garden. But with Avocado? I absolutely will have to try that. That combination never entered my head but it looks delicious.